The Computer Graphics and Animation industry are full of promise. Every year the animated movies tend to score the biggest box-office success. Not only movies, computer graphics, and animation are used in broadcasting, games, theme parks, industrial animation, virtual reality, and scientific and medical research. There is also a heavy use of computer graphics in the design sector including in automotive design, consumer products, industrial design and interactive design. All graphic design jobs require attention to detail, design sense, problem-solving skills, and up to date knowledge of the latest software. DreamZone's School of Graphics and Animation teaches concepts and tools for graphic design, web design, 2D & 3D Modeling, animation, and post-production functions. Yes, we begin with teaching good old drawing concepts and go on to cover the design fundamentals of color theory, graphics, design elements, typography, scanning & color correction, and printing. And, if you take our animation programs, we start with conceptualization, sketching & storyboarding before proceeding to the creation of stories using the 3D/2D software in the advanced stages of set modelling, character modelling, texturing, lighting, animation, visual effects, and rendering. Our faculty team comprises graduates in visual communication and arts with specialization in animation related software. The only criterion to enroll in our programs is interest - just basic education is good enough. Our Curriculum & Product Development team, headed by product managers, interact with the industry regularly, collect inputs, and update our curriculum and reference guides to improve the employability of our students. Group discussion forms the vital part of our teaching. We give our students various creative designs inputs; ask them to analyze the concepts, and trigger the creative juice to flow by engaging them in innovative activities. An open styling competition for public and fashion aficionados. 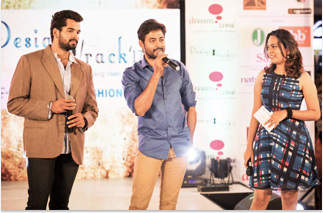 The competition will be a part of DreamZone’s sixth edition of Design Track, a fashion show, to be held on 7th January, 2017 at Citi Centre, Chennai, from 2-7 pm.